Analogue Research Stations are laboratories for learning how to live and work on another planet. Each is a prototype of a habitat that will land humans on Mars and serve as their main base for months of exploration in the harsh Martian environment. Such a habitat represents a key element in current human Mars mission planing. Each Station's centerpiece is a cylindrical habitat, "The Hab," an 8-meter diameter, two-deck structure mounted on landing struts. Peripheral external structures, some inflatable, may be appended to the Hab as well. Airlock door: Entry to a small room, where crew members wait while the room is 'pressurised'. At MDRS, this is simulated using a 5-minute time delay. There is a similar airlock called 'engineering' or secondary airlock on the opposite side. Greenhouse: Contains the water recycling system at the front and the glasshouse at the back. Satellite dish: Enables the communication via internet with the crew. The bandwidth is very restrictive, 450 Mb/day that includes sending all daily reports to Mission Support Mars, photos and keeping webcams live. Observatory: Harbours a Celestron CGE 1400 Telescope that uses a STV Deluxe ST2000 XM camera for taking digital images of the night sky. Rovers: 4 individual rovers are provided to the crew: Viking, Opportunity I, Opportunity II and .... There is also a 'pressurised rover' (4WD) for longer trips or to be used in emergencies. 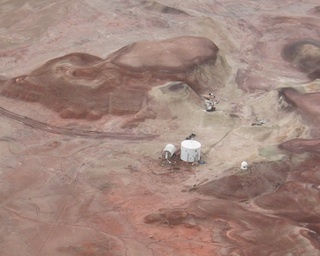 The MDRS habitat is situated in a fantastic landscape that looks just like the Martian surface. The Hab is surrounded by low hills of all sorts of colours, from dark reds, through pinks, ochres and greys to dazzling white rocks and sands. The surface immediately around the Hab is dusty and hard, but as you move further away you encounter more rocky ground as well as sand drifts. At this time of year ? (spring in the United States) the daily temperatures are starting to clmb, and when the Mission 118 crew arrived it was 29 degrees. The forecast is for 31 degrees for the first three days of the mission. The intense dry heat is nothing like Mars would get of course, since it's so much further from the sun, but the dramatic desolate landscape and the intense silence give an appropriately alien quality to the environment. Next to the Hab is a greenhouse, which is empty of plants currently. On Mars, explorers will almost certainly need to have such a facility for growing fresh food. Up on a small knoll quite close to the Hab is a small observatory, linked to the Hab by computer. With no light pollution out here in the desert, this enables excellent viewing of the northern hemisphere sky. Image courtesy of Doug Martin, Mars Society at Georgia Tech.